On November 26, 2008, a series of coordinated attacks and bombings across Mumbai caused widespread chaos in India’s largest city, and left 175 dead and 308 wounded. 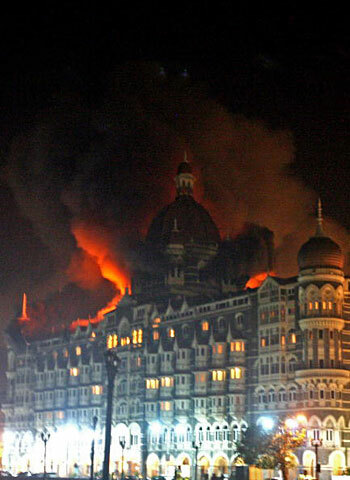 Among the locations hit hardest was the Taj Mahal Palace & Tower, a 107-year old five-star palace, in which armed terrorists set off explosives and took hostages. When the 60-hour siege had ended, the hotel stood in ruin, bullet-torn, engulfed in flames, with a severely damaged roof. 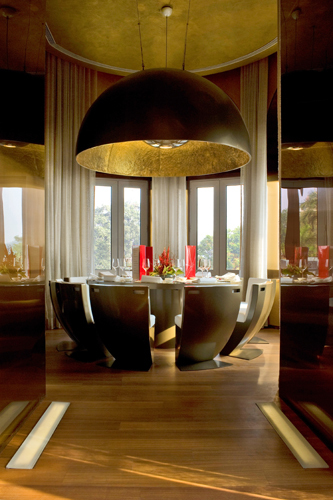 This weekend though, the Taj hotel opens once again, with more luster than ever after undergoing extensive renovations. “This flagship property, this venerable Old Lady, is going to reopen in the same glory, the same splendor of more than 100 years,” said Ratan Tata, chairman of the hotel group, who promised to “rebuild every inch” of the iconic building. And then some. The large iron pillars of the grand ballroom have been made over in tones of gold; luxury suites have been completely refurbished; and the domed palace wing, badly damaged from explosions during the siege, has reclaimed its radiance. The hotel group has also added a modern security system. The project took 21 months to assess and restore damage, and cost more than $38 million in repairs, an amount which the hotel says it more than lost in business while closed down for reconstruction. Several less damaged wings opened earlier, but the palace will open in full, including its popular heritage wing, this weekend. And celebrations have already begun for the hotel’s reopening, a symbol for all the country has overcome since the Mumbai attacks. Appropriately, the Taj hotel will entertain its first guests this Sunday, India’s independence day.